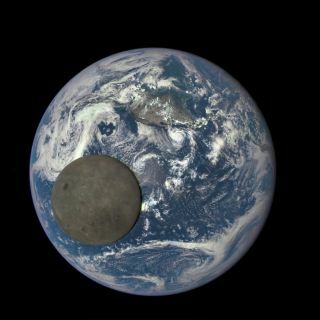 This image shows the far side of the moon, illuminated by the sun, as it crosses between the DSCOVR spacecraft and the Earth — 1 million miles away. The moon crosses Earth's face in a spectacular new video captured by a spacecraft watching from a million miles away. The Deep Space Climate Observatory (DSCOVR) studies the solar wind and snaps vivid shots of Earth's surface from its position about 1 million miles (1.6 million kilometers) from the planet. Recently, the moon entered DSCOVR's field of view, and the spacecraft caught the amazing lunar transit on time-lapse video. The moon is tidally locked to Earth, so it always keeps the same face pointing at the planet. Because DSCOVR observes from a spot between the moon and the sun, the spacecraft's images show the moon's unfamiliar far side. The far side — sometimes called the "dark side," which is misleading because it receives just as much sunlight as the near side — is impossible to see from Earth. The Soviet Union's Luna 3 spacecraft exposed its contours for the first time in 1959. The moon's far side is very different from its well-known front face. Instead of the "Man in the Moon," whose dark patches formed when craters created by cosmic collisions filled with lava, the far side is all mountains and craters without the dark, flat plains. NASA's Earth Polychromatic Imaging Camera (EPIC) snapped the photos that make up the new time-lapse video over a 5-hour span on July 16. Each image combines three single-color snapshots. That origin can be spotted in the photos, which show a faint green outline on the right side of the moon's disk due to the system's movement during the photographing process, NASA officials said. Starting next month, NASA will post daily color images of Earth from EPIC depicting different views of Earth's rotation. The DSCOVR mission itself is a collaboration among NASA, the National Oceanic and Atmospheric Administration and the U.S. Air Force, and its primary goal is to monitor the solar wind.